In September, Sam Adams will travel to Rio de Janeiro, Brazil for the Mayors´ Summit and the Cities & Transport International Congress. Adams will also participate in the session “Cities in the new climate economy,” where he will discuss the possibilities for ensuring urban development around a low carbon economy. These events are hosted by WRI Brasil | EMBARQ Brasil as part of EMBARQ Brasil’s 10 years celebration. Below is an exclusive interview for TheCityFix and WRI Brasil | EMBARQ Brasil with the former mayor. Check the program and register at cidadesetransportes.org. Sam Adams, former mayor of Portland and Director of WRI US Climate Initiative, believes that integrated strategic planning for the city is the most efficient path to a sustainable future. 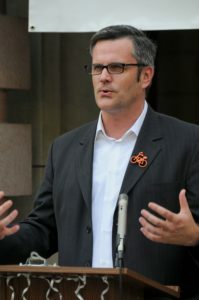 While in office between 2009 and 2012, he held strong to this approach and implemented a Climate Action Plan, which aligned with the Portland Economic Development Plan. The plan contained clear emissions reduction goals for each sector and put Portland on track to achieve the city’s objective of reducing their greenhouse gas emissions by 80 percent by 2050. In your opinion, what are the main challenges that cities are currently facing? How do we attend to 21st century demands? Sam Adams – The key challenges that cities face are demands for services that outstripped resources to provide them. Cities face growing challenges affecting infrastructure for transportation and transit, water, sewer, food – climate impacts with more severe weather, more unstable weather, issues of droughts, floods, snowpack, heat; a growing disparity between rich and poor and the strain on middle class families. Addressing these challenges requires cities to take an integrated approach to problem solving and work to improve local infrastructure so that it produces a range of benefits. For example, not only looking at moving more people to public transit options but also looking to reduce trips overall by building complete neighborhoods around transit stations that include diverse incomes. We all know that is not easy to make changes happen in major cities as there are many different interests at play. What were the main forces you had to work with? How did you succeed? SA – The first part of my term was during the economic recession and we experienced a significant loss of jobs, a significant increase in homelessness, and budget cuts at the same time. The first task was to provide and to find resources in creative ways, in cost-effective ways, to provide assistance to those who were experiencing the worst impacts of the economic recession. I looked not only within city government for opportunities to become more efficient and effective, but also gathered together all the other governments, put them together, and made a more integrated and strategic approach to the provision of public services. Could you describe an example of an action that succeeded in moving forward this strategic plan? SA – When I was elected mayor, I found that planning and budgeting in transportation did not come together to coordinate their budgets. So you had the light rail and the bus system, the regional system not run by the city government that was responsible for the streets and the street car system, and the bike and pedestrians programs. All of these programs had good intentions, but were not taking the opportunity to improve integration and cooperation, deciding on a year-by-year basis their priority for investments. Often times we would have one agency make cuts for transit services and bicycle infrastructure without looking at the disproportional impact that they were having on other systems with their decisions. So, we brought them together to begin not only looking at the strategy, but also, on a year-by-year basis, looking at priority investments and budget. 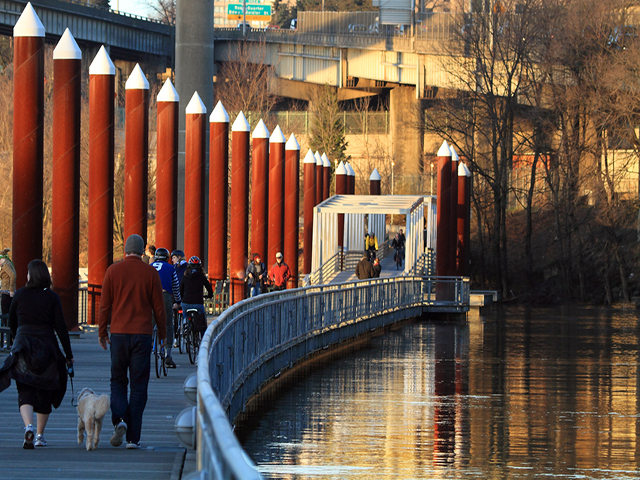 Portland reduced its carbon dioxide emissions by about 11% from 1990 to 2013. What were some of the steps you took to achieving this? SA – We got a Climate Action Plan approved when I was mayor. It was a ramping up of our efforts at being a low carbon, prosperous economy. We set a goal to reduce their GHG emissions and specific actions for each sector, which made contributions to GHG emissions reductions. So, for example, in the area of garbage and landfills, we made a major change in the services that we provided regarding to garbage, recycling, and composting. We went from every-week garbage pickup to every other week garbage pickup. That program, after a couple of years, reduced the amount of garbage that we sent to the landfills by 34%. During my time on city council, we constructed 75 miles of bikeways and we were able to calculate the reduction of GHG emissions as a result of the increasing number of bike trips around the city. We were able to provide safer, cheaper means to get around in Portland. These things have an impact on the ground with real world benefits, it’s so important. Portland was considered one of the most sustainable cities in the world. What were some of the challenges you faced, given the city’s unique characteristics? SA – It’s a combination of our results and our actions. The fact that we had a strategy that gets updated on a regular basis is a key attribute for which Portland was recognized: having a strategy, having metrics, regularly doing a GHG emissions inventory. The challenges are always around. The perception that you have to choose between doing good for the climate and the environment or doing good for the economy and jobs is a false choice. We worked hard to make sure that when we were doing good for the environment we were also doing good for the economy. It’s a challenge that people still think that we have to choose between the two. Also, the federal policy is not always consistent, is not always supportive to local actions around climate action and low carbon prosperity efforts. Sometimes it’s obstructed and sometimes it’s the lack of it that is the challenge. What is the most important lesson that you learned as mayor? SA – Acting without an overarching strategy is almost always going to be more expensive and less effective. Having an overall strategy and a strategic plan, a climate action plan, an economic development strategy, an integrated strategy for improving your city’s health, prosperity, education and equity – these things make it easier to pursue and complete a climate action initiative. It holds yourself to a high standard and people recognize that you’re not just doing climate action for climate action alone: your work is also trying to improve people’s housing, their education, their prosperity and equity. An integrated strategy and an integrated approach is the key. What phrase or the idea do you want to spread to the world? SA – With smart and holistic strategic planning, focus on ‘place’ and ‘people’ for a prosperous, educated, healthy and equitable city.